Afternoon tea is a favourite past time and the best way to catch up with dear girlfriends but what if afternoon tea was given a twist? 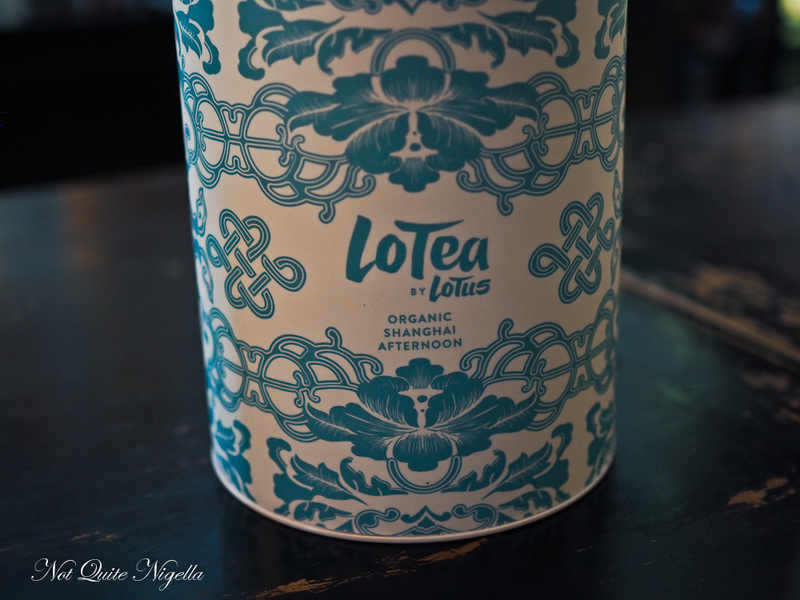 How about a Chinese high tea or in this case a Lotea. Lotus in the Galeries Victoria in Sydney offers diners a unique Chinese themed afternoon tea with Chinese morsels and a delightful selection of organic teas and tea infused chocolates. It was a chilly Winter's Tuesday afternoon. I had expected that the last two weeks of August would be edged with warmth and certainly it wasn't as chilly as it could be. But I was walking the grey concrete streets of Sydney's CBD where tall buildings reach over each other dwarfing people and stealing the sunlight. I fastened up the top button of my coat, dug my hands further into the pockets and hurried up George Street to meet my friend. It has been months since I had seen Girl Next Door. She had just returned from 7 weeks overseas and she had tales to tell. I had tales to tell. And where else can two gals catch up best than over afternoon tea? 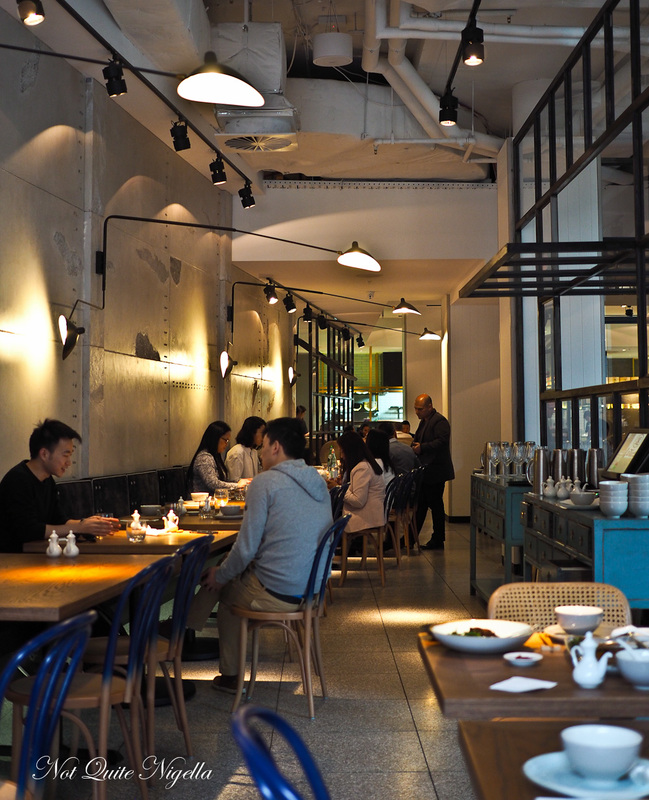 Lotus Dumpling Bar had opened up a second branch alongside their Walsh Bay location, this time on the first floor of the Galeries Victoria. It's an enormous space designed by Paul Papadopolous of DS17 (who also designed Alpha). 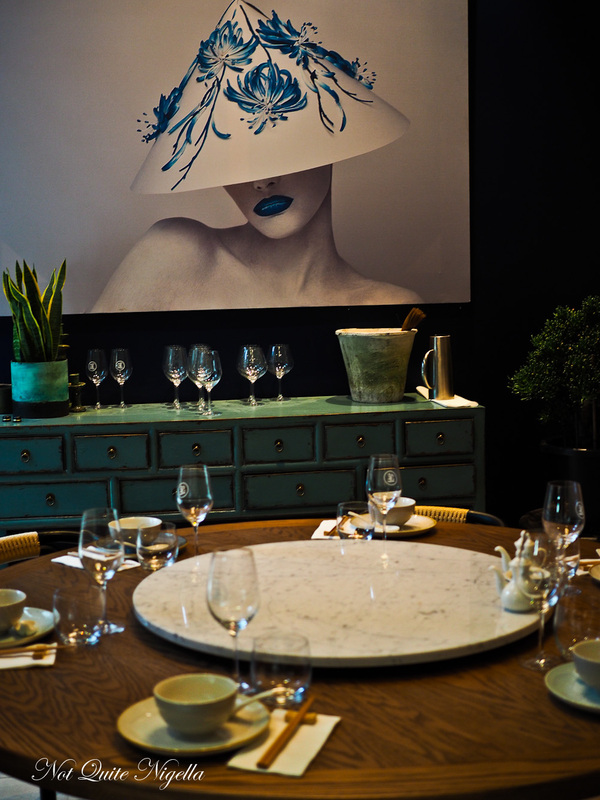 The head chef is Chris Yan who worked with Kylie Kwong for many years. The menu during lunch and dinner is larger than Lotus in Walsh Bay and there is a live seafood tank with plenty of options. 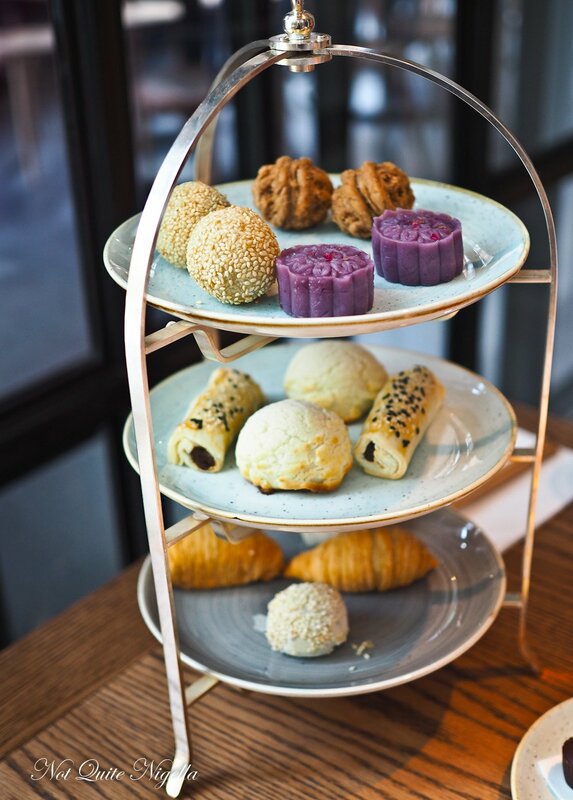 In the afternoons, diners can also book for the LoTea experience which is a Chinese afternoon tea at $38 a head. 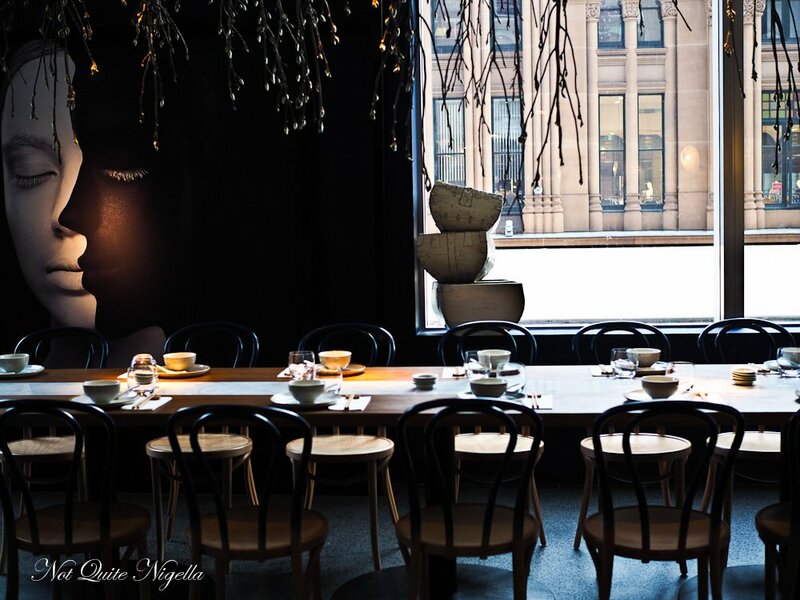 For $52 you can get a glass of Chandon Brut and for $62 a glass of Veuve Clicquot. Booking is recommended but they can also accommodate walk ins. There is a display of eight organic teas to choose from. Their signature tea is the Dragonwell and there is a mix of Chinese and Western teas to choose from. 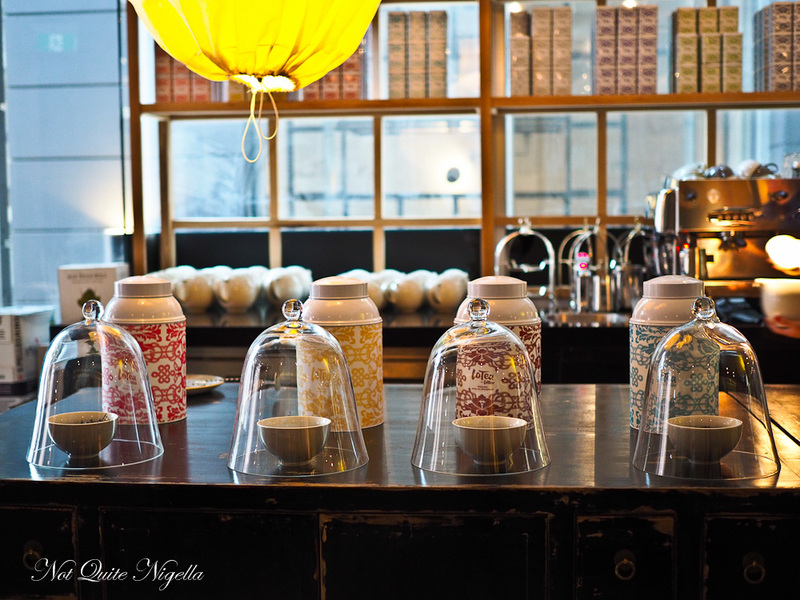 We are invited to lift the glass cloche to smell the aroma of a tea to help select one. Girl Next Door goes for the smokey Shanghai Afternoon tea while I go for the organic Milk Oolong that has a milky aroma. All of their teas are sourced from Taiwan. 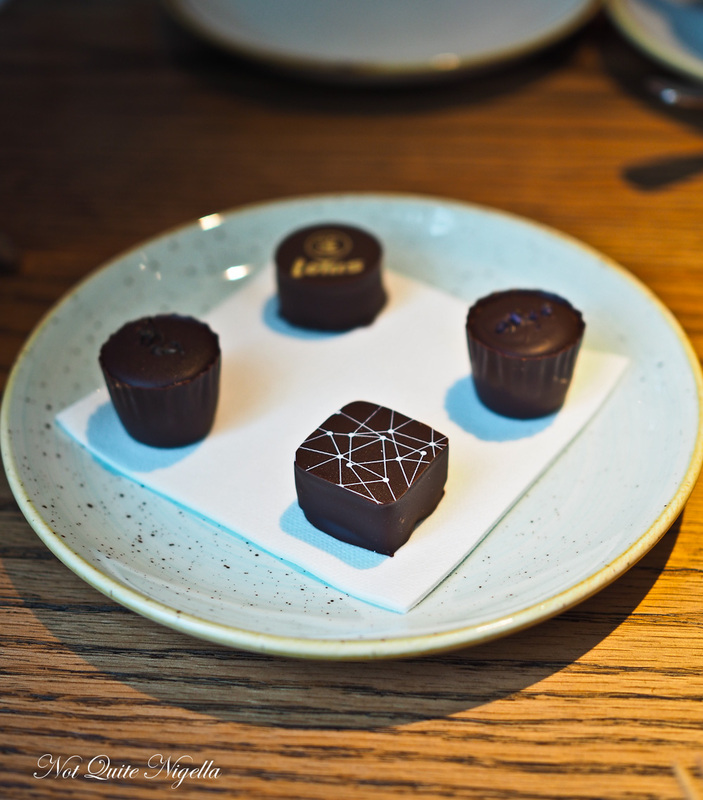 As part of the afternoon tea you can also choose two tea infused chocolates per person from the selection of eight. We sip our teas (which are absolutely divine) and catch up on everything that we've missed from each other's lives in the past few months. 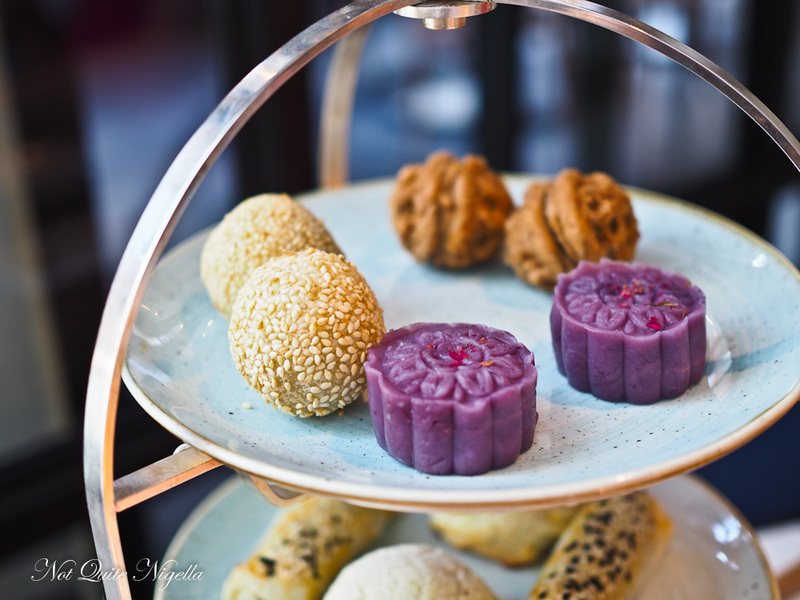 The afternoon tea takes a while to come out but once it does we notice that all of the savouries are warm which is very nice indeed because they are all variations of dim sum dumplings that really would not be good cold. I start with the middle stand. These are all Chinese morsels so there aren't any scones on offer here. I bite into a baked black pepper beef fillet finger pie and the pastry is short and the filling peppery. It's a very good start. I then pick up the BBQ pork bun which has a sweet, crackly crust along the same lines of the one that Tim Ho Wan but less sweet. This too has plenty of filling. Moving onto the bottom stand of savoury items I try the pleated deep fried white radish cake. This is Girl Next Door's favourite and to be honest I liked all of the savouries as much as each other. "A Mouthful" is an apt name for a ham and spring onion sesame coated ball. 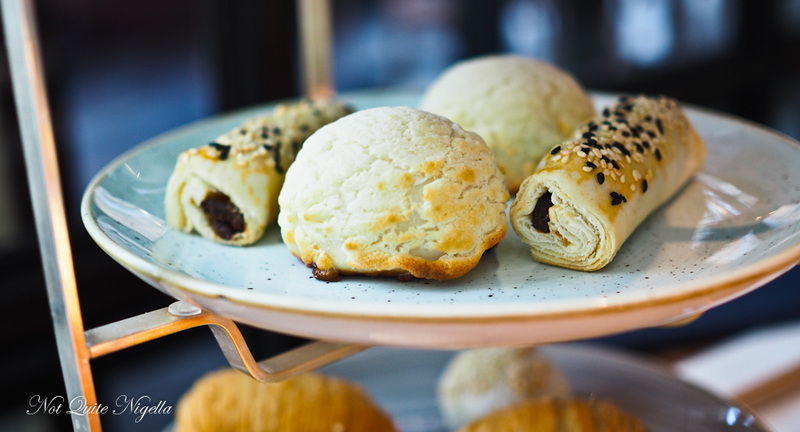 One thing is that the savouries are all baked or fried so if you prefer steamed dim sum there aren't any on this afternoon tea. I would love to tell you that I had a break before launching into the sweets but that would be a bald faced lie. I went for it like Cookie Monster would have with a jar of freshly baked choc chip. 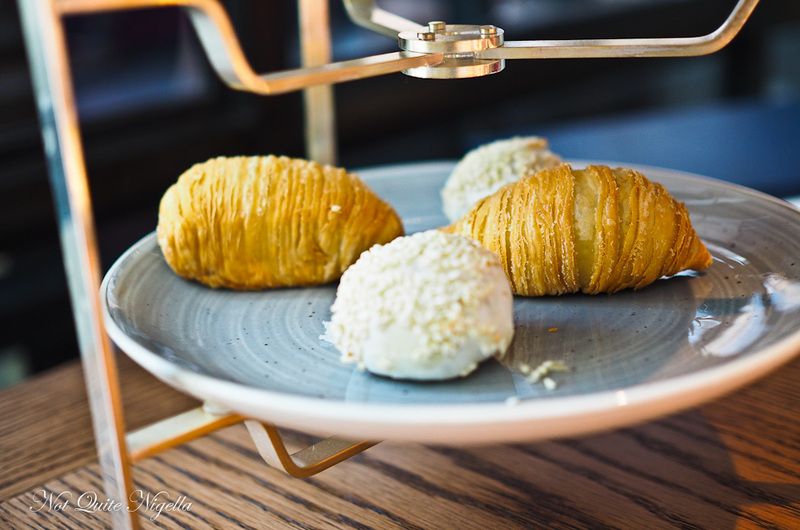 The baked walnut puff is a little savoury as well as sweet and looks just like a walnut (almost too cute to eat-almost!). The only item I didn't really go for was the purple yam cake filled with coconut. They're two ingredients I normally really enjoy but the richness of the savouries and the other sweets means that it tips me over the edge. And speaking of rich, that's the last bite, the deep fried sesame ball filled in molten milk chocolate. I couldn't think of a better ending. Or could I? We haven't even touched the chocolates yet. We cut each in half to share. We have the Dragonwell, Darjeeling, Earl Grey and Jasmine. They're all very good but the flavours in the Earl Grey and Darjeeling are a little muted as the dark chocolate flavour is strong against the tea. It's the dragonwell chocolate with the a tea infused cream white and milk chocolate ganache centre that really stands out with a distinct tea flavour. Ahh ok, that's a good last mouthful. So tell me Dear Reader, when you have afternoon tea do you eat the sweets or savouries first? Would you order a Western or Chinese tea here? And would you miss the scones and sandwiches? This meal was paid for independently. restaurantOpera With A Harbour View: Turandot on Sydney Harbour! restaurant Opera With A Harbour View: Turandot on Sydney Harbour!